Tuscania was one of the most important Etruscan cities ever, even if its Etruscan name is not known and it never acquired the status of Lucumonia. The legends tell us that Tuscania was founded by Ascanio, son of Aeneas, who probably lived in these parts, or Tusco, son of Ercole and Araxe the queen of the Shiites. In any case, the area of Tuscania is inhabited since the Villanovan period. Once it was considered only an agricultural city under the most important Tarquinia, today we are re evaluating it as also religious center. The excavations conducted after the earthquake of 1971 led to the discovery of a protohistoric village, or at least the age of the bronze age, under the current hill of San Pietro. 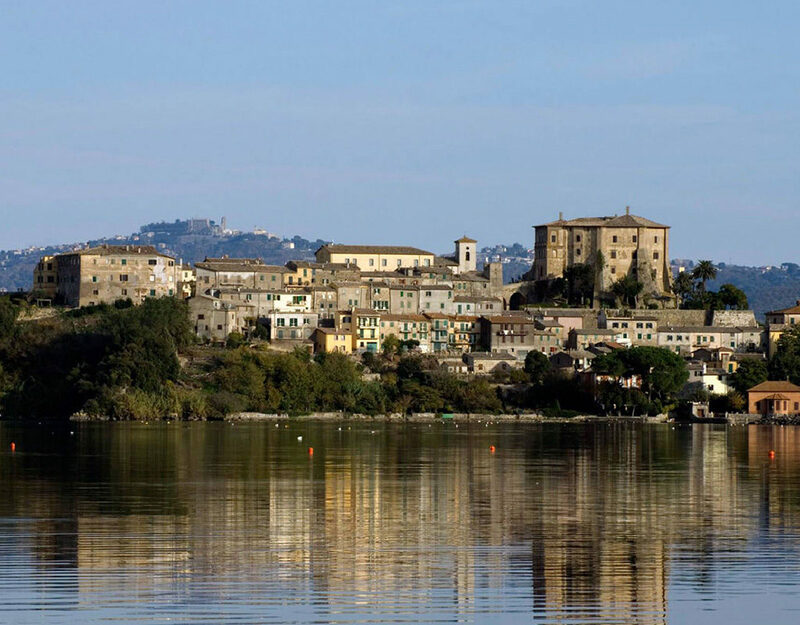 The area of the hill of San Pietro is the highest (acropolis) located on the right side of the river Marta or along the strategic line that leads from Tarquinia to Lake Bolsena. Subsequently, with the construction of the Via Clodia, a direct connection with Rome was added to the original direct line, which, if possible, increased the importance of Tuscania. To demonstrate this, there are at least five Etruscan Roman necropolises around the acropolis within a radius of a couple of kilometers. In the necropolis of Tuscania you can see almost all types of Etruscan tombs. From the archaic mounds with circular drum of the Ara del Tufo necropolis of clear Ceretan influence, to the upper slit tombs (typology of tombs present only in Tuscania) of the necropolis of Ara del Tufo and of the tombs located in the Scalette area. Practically we start with the archaic tombs of the VII – VI century BC to get to the late Hellenistic tombs of the first century BC. This shows that for over 600 years in Tuscania there have been families “at least wealthy” that could afford beautiful and expensive tombs and beautiful sarcophagi both in nenfro and clay (in terracotta) of the II – I Sec. aC. In no other Etruscan city there have been so many sarcophagi as in Tuscania, which thanks to the exhibition held in London in 1837 by the brothers Carlo, Secondiano and Domenico Campanari, sons of Vincenzo, gave it the name of Etruscan sarcophagi. In Etruscan times Tuscania is one of the most significant centers of southern Etruria. Until the middle of our century the interest in this city was rather marginal. For some decades now, however, some scholars have been devoting their attention to the different aspects that Southern Southern Etruria presents: consequently the survey on weight, which Tuscania had in this context, is becoming more and more accurate, thanks also to the considerable quantity and quality of finds that come to light from time to time. 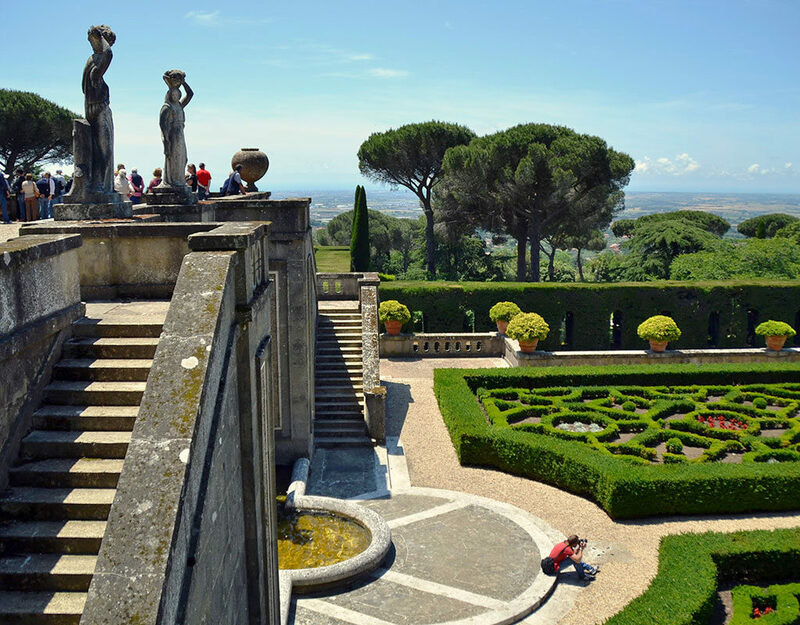 The path in the picturesque town starts from the top of the uninhabited hill of the Civita, where the majestic St. Peter’s Basilica with its two towers (VIII-XIII century) reigns majestically. The church, a work of absolute value, is one of the most striking examples of the early Romanesque style, the result of an overlapping of Tuscan, Umbrian and Abruzzi influences that makes it unique. 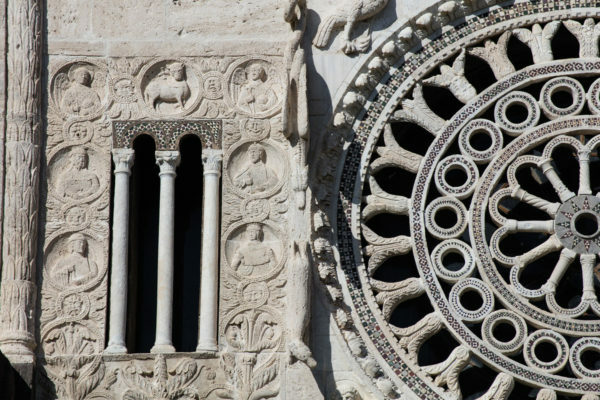 The elegant facade, in which the white marble decorations stand out on the tufa of the mighty perimeter walls, presents a wonderful rose window surrounded by a complex iconographic apparatus, a reflection of the medieval mentality that found in the images the form of privileged communication. The interior, sober and solemn, has a plan with three naves divided by original arched ringed arches, with bare columns embellished with precious capitals; evocative the crypt located under the presbytery, with twenty-eight columns that support the vault. 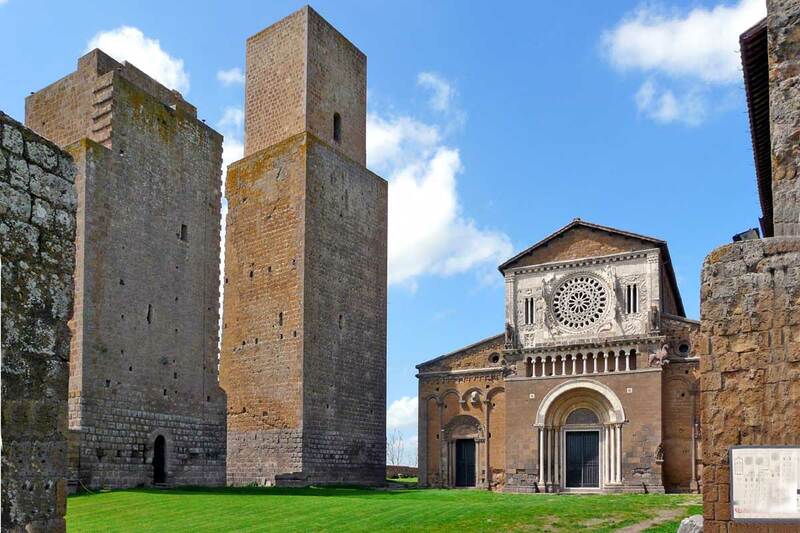 At the foot of the hill is the other Romanesque jewel of Tuscania: the basilica of Santa Maria Maggiore, coeval to the first and inspired by it in the overall project, but with a greater wealth of furnishings and paintings inside. 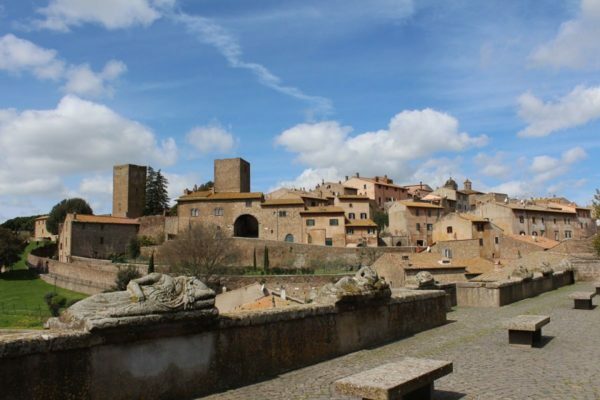 In the historic center: strolling in Tuscania means reliving the atmosphere of the ancient villages of Tuscia, where the warm colors of medieval palaces and towers, churches and Baroque fountains blend harmoniously with the surrounding landscape. Places where you can come across enchanting views, such as the Piazza del Comune, exceptionally surrounded by covers of Etruscan sarcophagi, which dominates the ancient source of the Seven Cannelle, the Baronial palace and a section of the walls; like the Via dei Priori where you can admire craftsmen working according to traditional techniques, or the Via degli Archi which culminates with a belvedere overlooking the ocher roofs of ancient tiles. But it is from the Tor di Lavello park, at sunset, that you can move in front of the superb spectacle of the ruins of the ancient city walls, of the Rivellino and of San Pietro, which is the backdrop for the verdant valley of the Marta. 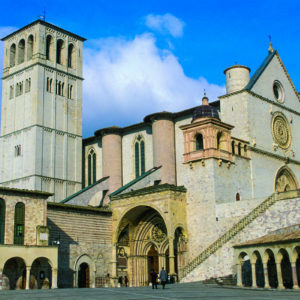 One of the most famous villages in Italy is Assisi, UNESCO World Heritage but, above all, the land of man who renounced all his belongings to devote his life to helping the needy. 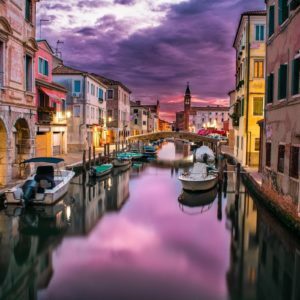 It is always simplistic to draw up a list of things to do in Venice. There are so many, in fact, the details, the glimpses that to talk about one becomes inevitably wrong to the other. 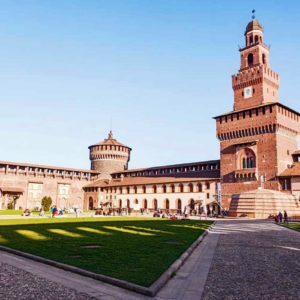 If you are wondering what to see in Milan, discover the attractions that you should not miss when you are in town for the first time.